When you bring in a double James Beard Award-winning chef to re-engineer your menu, what you get is culinary magic at the Breckenridge Distillery Restaurant. 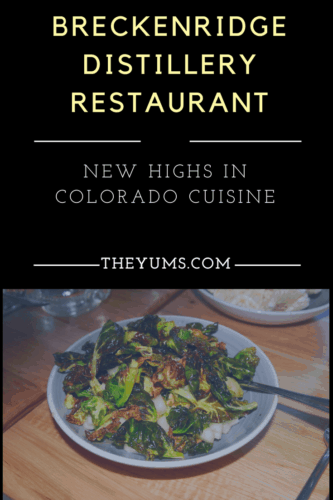 Now, in addition to bragging about the highest distillery in North America, Breckenridge can also brag about the award-winning Breckenridge Distillery Restaurant, one of the finest new restaurants in Colorado. Housed in the same building, the distillery and restaurant complement each other, with both sharing the same commitment to excellence in their service and products. Chef David Burke, who was twice awarded the James Beard Award, came from New York to create the dazzling new menu at Breckenridge Distillery Restaurant. The restaurant has quickly garnered a large number of loyal customers, who rave about the new, imaginative and flavorful items on the menu, as well as the elegant, casual atmosphere of the new restaurant. Thoughts: What a great complement to the distillery on site! I highly recommend taking a tour of the distillery before (or after) dining at the restaurant. Many of the products made at the distillery are included in recipes used by the chefs, like the Breckenridge Bourbon used in the Bourbon Float, or the Chocolate Mousse with the Breckenridge Espresso Vodka. The interior is very nice – upscale but not stuffy at all. Like most places in Breckenridge, people dress casual and comfortable. The waitstaff is exceptionally personable. They are very pleasant, patient, and happy to answer questions and explain dishes and make recommendations. The overall dining experience is wonderful – the great food, classy atmosphere, friendly and efficient staff. What’s not to like? I loved the Korean Pork and the Kansas City Steak. Both were very tender and tasty, cooked to perfection. The group at our table shared many dishes, and every dish was a winner. The Brussel Sprouts with bacon, apple, hazelnuts, and maple was a definite favorite. The desserts were also fantastic – the Crème Brulee with candied pecans was absolutely delicious. For those who like a cocktail, BDR has a great selection to choose from. Try the Rickhouse Rhubarb Refresher with Breckenridge Pear Vodka, rhubarb/strawberry/hibiscus shrub, rhubarb bitters, citrus and effervescence. Or maybe a Cuckoo Coconut, made with spiced whiskey, coconut elixir, turmeric, pear and a touch of nut. There are even three Mules to choose from – A Perfect Mule, Breckenridge Burro, and Tea Time Mule. It’s good to know that BDR is accessible via the Summit Stage bus route and that BDR offers a free shuttle every day from 11 am – 10 pm. So if you don’t have a car, or just don’t feel like driving, you can still easily get to the restaurant and distillery. For those of you visiting Breckenridge, I would definitely put Breckenridge Distillery Restaurant on my must do list. Take the tour first (it’s very interesting even if you don’t drink). Then sit down, relax, and enjoy a wonderful meal. Be sure to try those Brussels Sprouts! Disclosure: The author received a complimentary meal from Breckenridge Distillery Restaurant.